2nd layer includes a 600 denier rip-stop, waterproof, highly breathable Lami-Cell outer shell. Rolled nylon at the withers, criss-cross belly straps with snaps and Ds, removable leg straps, tail cover. 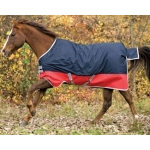 This Rug is 100% waterproof and breathable, with a tough-as-nails outer shell. 1000 x 2000D Textilene mesh with lined chest, padded withers & detachable straps, HOT NEW colors. 600D Ripstop Teflon outer shell & removable rear leg straps & comes with tail flap. 600D Ripstop Teflon outer shell & 80 grams of fiberfill, removable rear leg straps & tail flap. 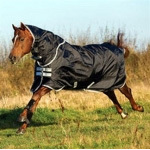 Breathable waterproof blanket features a 600 Denier Ripstop Teflon outer shell and 180g. Removable belly band, criss cross belly straps, adjustable buckles and keepers, and a removable tailpiece. Adjustable hook & loop, 600D outer, 180g fiberfill & 70D nylon liner, in NEW colors.